Ha...ha.....just look at him!!! Super little boy, he looks like he's doing Yoga! Going on my faves! 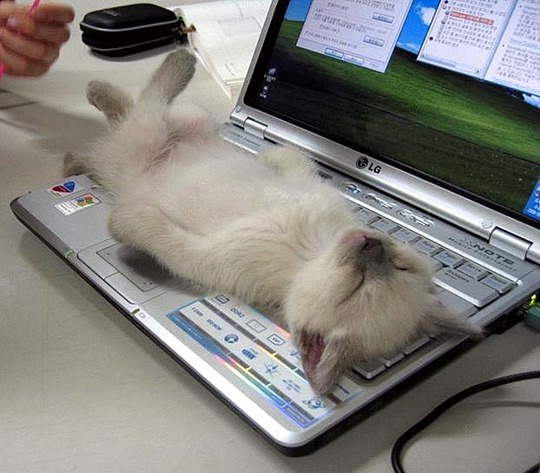 I wish I could be so laid back about using computer technology! He's got it all worked out!!! Looks like he thinks its a sun bed Lol..wonderful shot...gone on favourites ! Probably nice and warm BB! Too funny, is this done uo special on the computer? He looks like he's in heaven - probably the best back scratcher ever! ~was this the result of bracing Orkney air or did they have a hangover in the morning! Do you still have the mouse for your computer Islander? LOL. Nice shot!! What a shot, that is one laid back cat. What a fab photo, he's absolutely gorgeous! Oh he's just so CUTE!!! Glad we can see older pics when we blog etc now or I would've missed this little sweetie! What a great photo Islander. Is this called sleeping on the job!!! My little kitten sleeps exactly the same but in my arms and then you can move her anywhere its really funny and so trusting!! is this really true? does he know there is a mouse near by? someone's in heaven! haha brilliant! A severe case of repetitive strain injury ! looks so limp and lovely,would love to cuddle him right now. the strain of what pimpernel? breathing? ?